If you have Raynaud’s disease and go out in the cold, the blood vessels in your hands and feet will contract more than they should. Less blood reaches your fingers and toes, and they feel cold, tingly, and numb. If you don’t treat the condition, and your hands and feet are deprived of enough oxygen, ulcers and gangrene can set in. Raynaud’s disease can occur for no apparent reason, or it can result from other conditions. If this is the case, it is called Raynaud’s phenomenon. 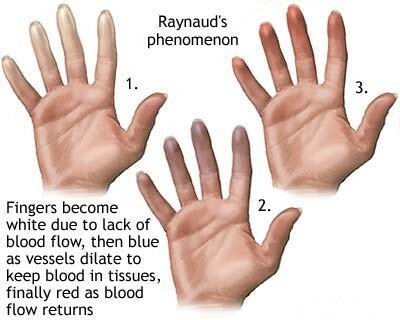 Raynaud’s disease is actually quite common. It occurs more often in women than men and usually begins to develop before age 40. Swing those arms. A few minutes of large, vigor­ous circles will increase the blood flow to your hands and fingers. Protect your hands and feet. Wear double layers on your hands and feet when you’re outside in cold weather. Woolen socks, mittens, and insulat­ed boots will hold in a layer of warm air. Indoors, be aware of the simple ways your hands might touch something cold. Drink beverages from an insulated glass, or wrap a napkin around a cold can or bottle. Use tongs to get ice from the freezer, or keep an old glove handy and slip it on when you need to dig out those frozen steaks. Avoid vibrating machines like chain saws which place a lot of stress on the hands and arms. And never abuse your hands by using them instead of an appropriate tool. Adapt your activities. Your day undoubtedly is filled with activities that can chill your hands. When cooking, washing dishes, or cleaning, use tepid water instead of cold, or pull on a pair of rubber gloves. Have you ever backed out of the driveway on a wintry morning? The steering wheel can feel like a ring of ice. Why not heat up the car a few minutes early or insulate the cold vinyl with sheepskin covers? Gardening can be a wonderful­ly relaxing activity but not if you’re digging in chilly spring dirt. Wait for a sunny time of day, and always wear gardening gloves. Exercise carefully. If you enjoy a brisk walk, a leisurely bicycle ride, or even a round of golf, by all means continue these activities. But when the temperature drops, make sure you protect your whole body with warm, comfortable clothing. Body heat lost through the head, neck, and wrists makes you especially vulnerable to the cold. Also, be careful to stay warm after you stop exercising. That important cool-down period should not make your shiver. Keep a sweatshirt or warm-up suit handy to reduce post-workout chill. Dress for the weather. Spring and fall are wonder­ful times to be outdoors, but the weather can be changeable and unpredictable. Too often, we underdress during these transition months and are caught unprepared. Unfortunately, Raynaud’s disease has no cure. That does not mean you have to let the condition control your life. With a few lifestyle adjustments, you can minimize your discomfort and painful episodes. Stop smoking. Nicotine narrows your blood ves­sels, restricting circulation. Poor circulation makes it even more difficult for your hands and feet to stay warm. Try to avoid cigarette smoke altogether. Relax. Stress can trigger episodes of Raynaud’s disease. Work on removing as many causes of anxiety from your life as possible. Avoid drugs that will affect circulation. Many cold medicines and diet pills contain the drug phenyl­propanolamine which can affect circulation. Read your labels. Try circulatory conditioning. Don’t worry, this is not as hard as it sounds. You are simply trying to “teach” the arteries in your hands to stay open, even when they are cold. When the weather starts to turn cool, sit outside for about 10 minutes with your hands in a bowl of warm water. Do this sev­eral times a day, every other day for about a month. This should help you make it through the winter. Learn biofeedback therapy. This will take a little more of your time, but the results can be longer lasting. With professional training, you can learn to control the temperature in your feet and hands, and eventually check attacks of the dis­ease. Not everyone sees improvement, but there are no drug-related side effects. Move to a warm climate. This may seem like a drastic measure, but if your condition is severe enough or simply interfering too strongly with your activities, you may want to consider relocat­ing somewhere with lots of heat and sunshine.